As a progressive, transdenominational synagogue, Pleasantville Community Synagogue seeks the best from the Reform, Conservative, Reconstructionist, and Renewal (RCRR) movements. You can read commentaries on the weekly Torah portion from each of these movements at their hyperlinked sites. We also recommend the Reform movement’s site for children Family Shabbat Table Talk and the Conservative movement’s Sparks and Masorti sites. The transdenominational Academy for Jewish Religion and Kolel: The Adult Centre for Liberal Jewish Learning also provide Torah commentaries across the RCRR denominational spectrum. There are a myriad of other Jewish communities – different than ours – on the web, ranging from the Society for Humanistic Judaism and the Center for Cultural Judaism to the Orthodox sites of Project Genesis, Chabad, and, for children, Akhlah. Many of these provide Torah commentaries as well. Other interesting sites providing Torah commentaries include Bluethread, My Jewish Learning, and The Jewish Agency for Israel. 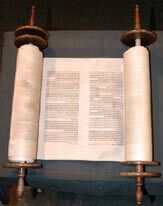 To explore further, try link launchers Torahnet or Shamash. As Ben Zoma said “Who is wise? The one who learns from everyone.” (Pirke Avot, 4:1).